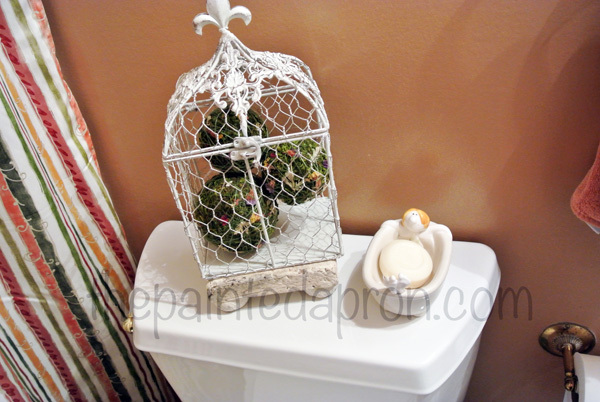 Home decor, Fast & Cheap! 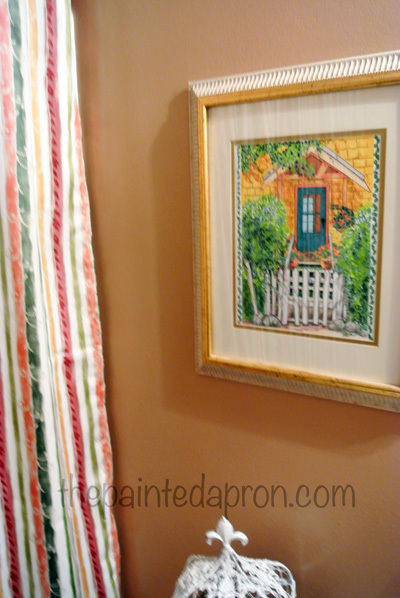 So years ago I hung a shower rod and some drapery panels and just pretended it wasn’t there! 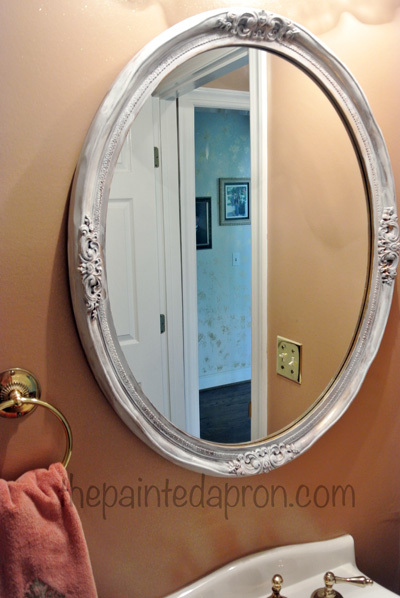 Short of ripping everything out, painting the walls and redoing the floor, my challenge was to update this powder room without expensive changes. 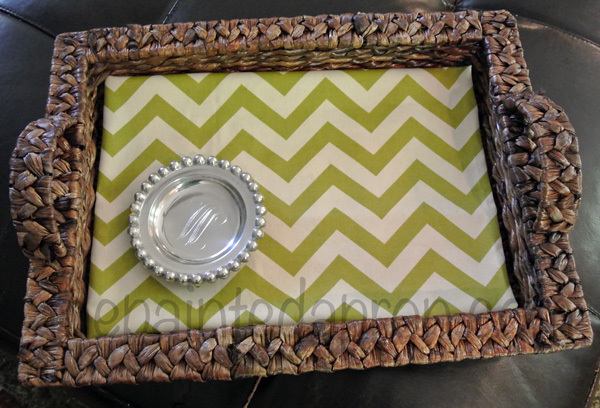 and a table runner~ I love the bright energy of the chevron pattern! I don’t want to go to crazy though, don’t want to tire of anything too fast. I found some fabrics that I loved but they were pricey…seasonal touches are one thing, and easily changed, but for the powder room I decided not to invest in fabric right now because my goal is to get the interiors of the main floor repainted this year…so this is a temporary re-do…just to keep me happy in the meantime. I looked at drapes and shower curtains and couldn’t find any that were close to what I wanted, and then I remembered I had this fabric! 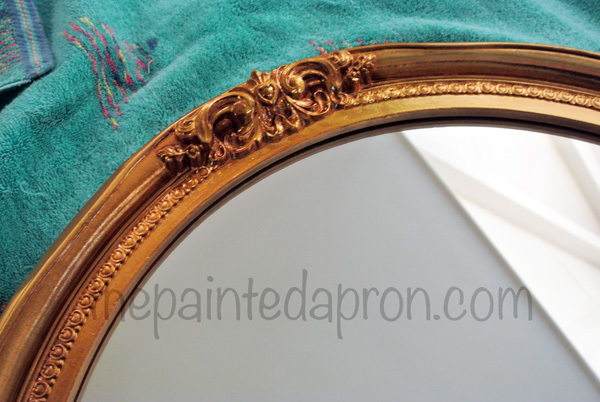 I bought this several years ago on super clearance and used it once to drape a prep area for a party. 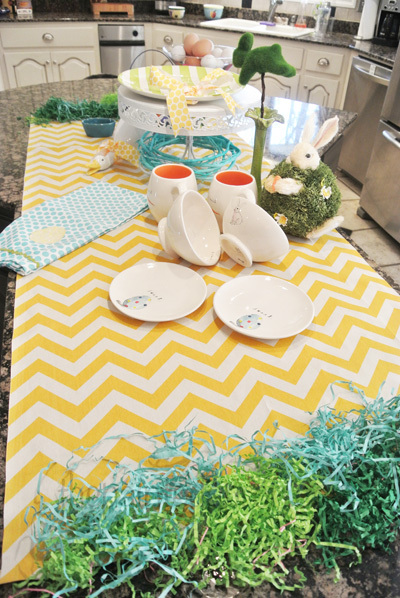 I saved it figuring it would come in handy someday… I was drawn to the bright warm colors and fanciful stripes. I dug it out and measured, it was the perfect amount! 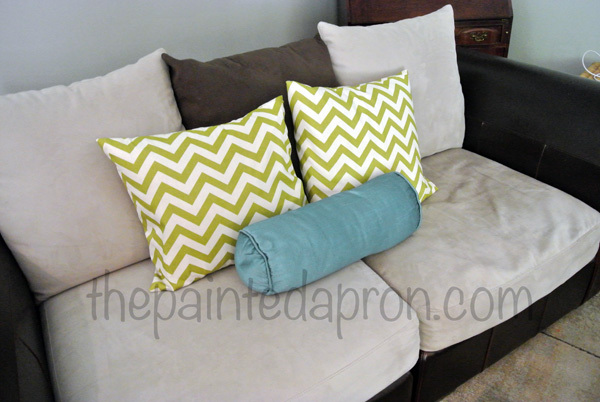 I used the old drapery panels as a pattern and recreated them in this fresh bright fabric. I stitched everything with a sewing machine. In no time at all I had a bright new look. 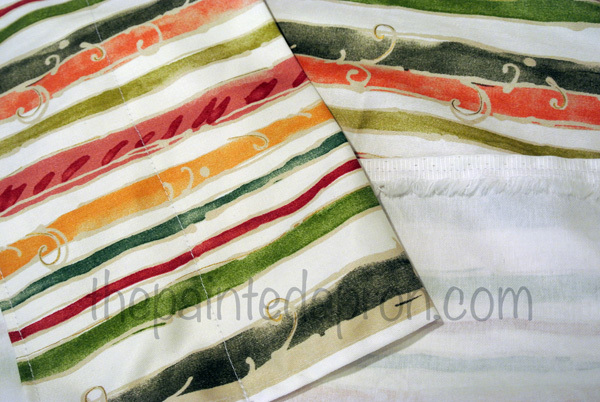 I am still debating if I want to put the cream sheer panel back in between the striped ones, but to keep it looking different from before, I opted to just use the stripes. I simply brushed some cream color acrylic paint lightly over the gold with a fairly dry brush to insure the paint didn’t cover too thickly. I wanted the gold peaking through just a little. 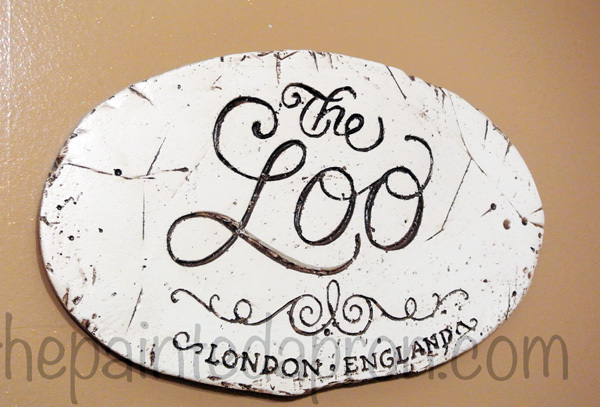 It looks very similar to the popular shabby chic vintage pieces yet, it took minutes to create, rather than hours. 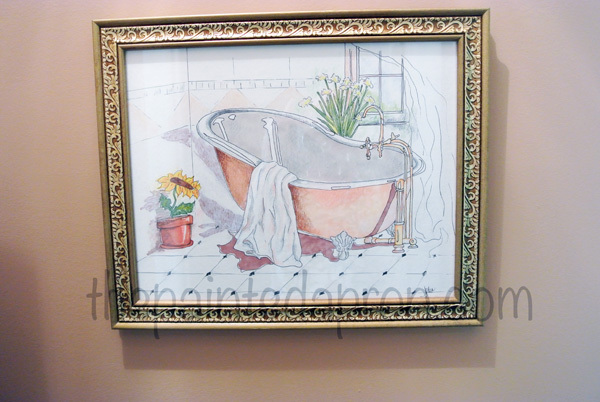 I changed the artwork around, this watercolor was in the hall and had just the right colors to match the stripes, and the frame is white and gold. 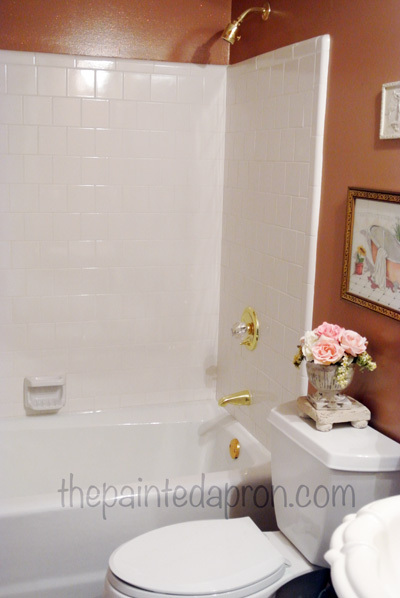 The delicate peach bath tub watercolor moved into the space in the powder room hall right outside the doorway. Little changes, but it looks so much fresher and I know it’s cleaner without those old dusty drapes! Considering I only spent a couple of hours and absolutely NO $$ on this little re-do, I am pretty happy for the moment! 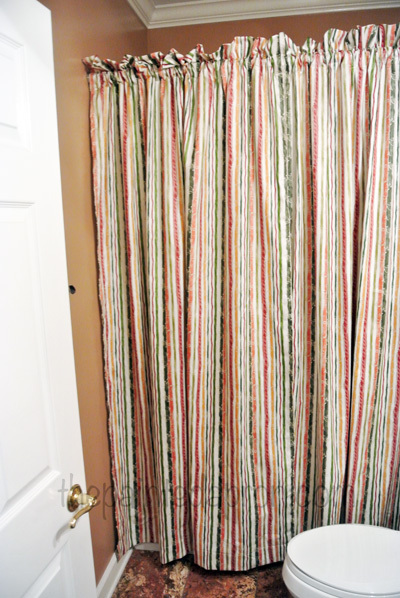 I am thinking about putting a sign behind the curtain for nosey guests like, “I bet you thought there would be dead bugs in here!” or “What are you looking for?” Ha! You know people take a peak! They probably do find a dead bug or two…..! I would love your suggestions, what would you do to update this bath? What color would you paint it? Would you keep the tub hidden? I seriously want your suggestions! Would you go with wallpaper in a bold print and plain panels for the tub? Do you think wallpaper is here to stay for a while? Help!! I would keep the tub opened up….it will open the room up more this way. Maybe a curtain off to one side only. Everything looks great my friend. Great changes Jenna! 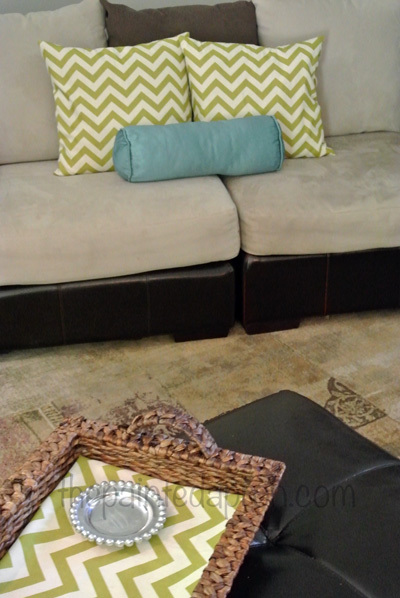 Love when you can liven up a room without spending a dime — such a great feeling! 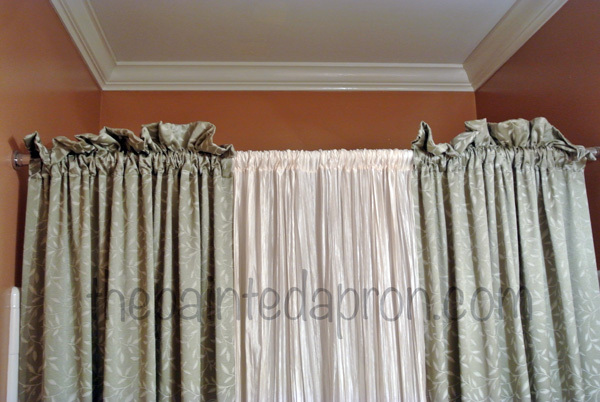 I liked Pride in Photoography’s suggestion of sweeping the curtain to 1 side to open the room up a bit more. You could open it on the side where opposite the gold fixture. 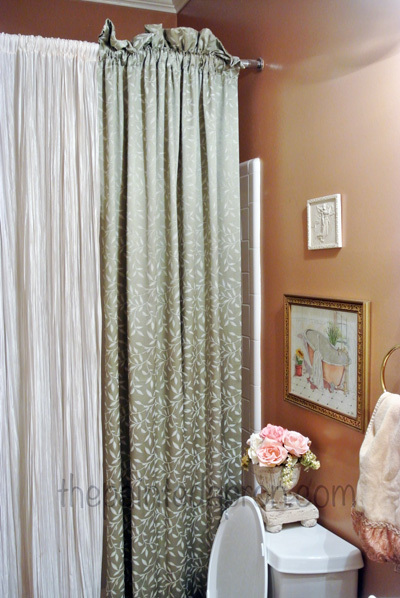 The curtain you created to put in there is really great, but dropping the curtain outside of the tub and sweeping it to one side will really give it pizzazz! 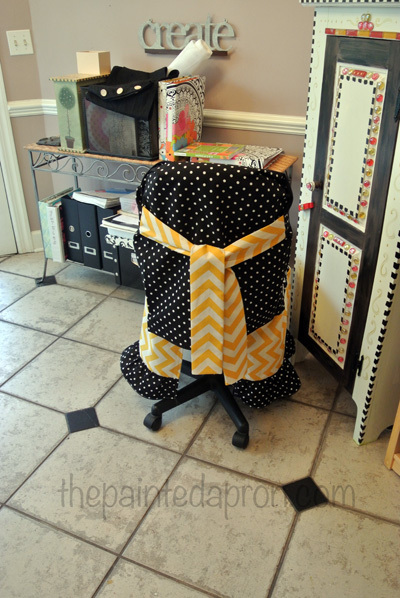 I just KNOW you can create something snazzy to use as a pull back on it! Don’t be surprised if you see those curtains on a table someday! Ha ha, might make a great tablecloth! I know smart Mary from Home is where the boat is stored stuff in one of her tubs, but I don’t want to do that in this room since it’s used by all household visitors. Thanks for you suggestions, it will probably stay just as it is for a while! Hi Jenna, I really like seeing all the white tile in the shower because it brightens the room up and also makes it look bigger. 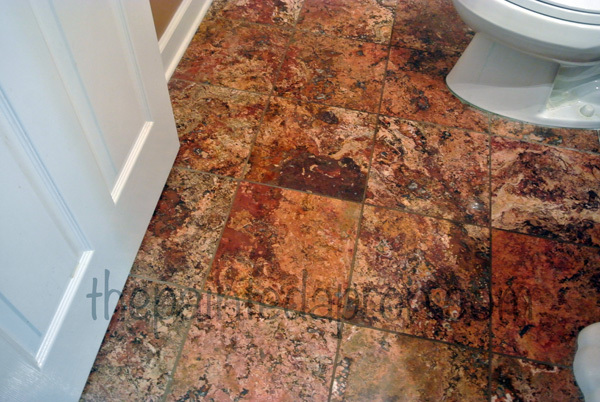 The color of the walls and the floor are enough for such a small space.I think maybe find a clear see-thru type shower curtain or at least sweep the curtain to the right side, that would show some of the tile and hide the brassy gold faucets. I think the wall color is nice , it goes well with the floors. Okey, dokey…you asked so I am happy to deliver an opinion! (duck!!) 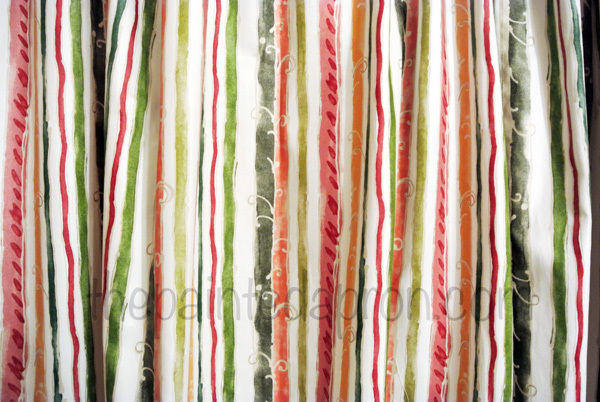 I love.. love.. love the striped fabric! And my preference would be to not break it up with the white panel as it’s so beautiful on its own. If you want to wallpaper, how about a tone on tone pattern? 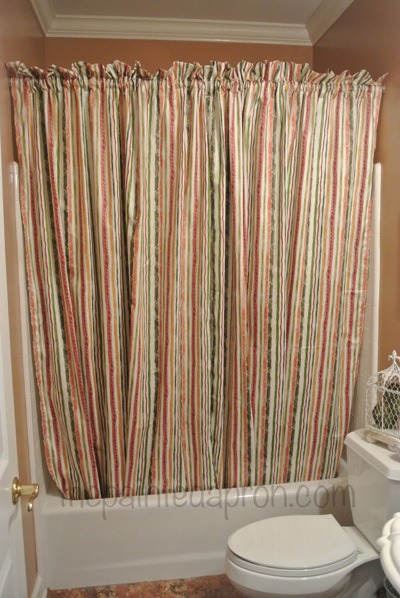 It adds interest without competing too much with the curtain. Or…. you could paint the walls a solid in one of the colors on the fabric. And as for the gold fixtures. 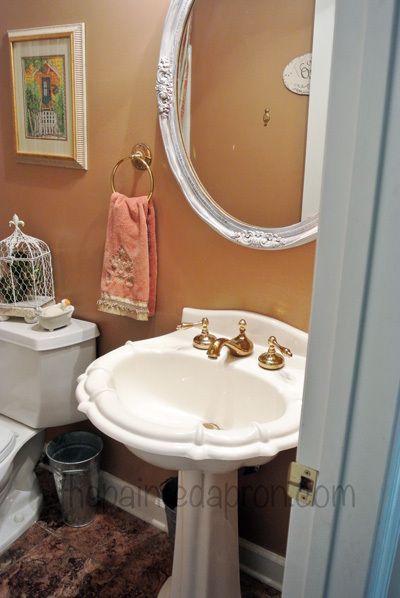 We moved into our house 7 years ago and the master had those gold fixtures we all loved in the late 80’s. Didn’t we think we were all so rich?? LOL The big debate when we sold this home was whether to replace these and give a more updated look. Yikes! The cost to replace the shower head alone made me cringe as they would have to attack it from the hallway to get to the pipes! We didn’t replace these fixtures and guess what…. the house still sold! Yipee! 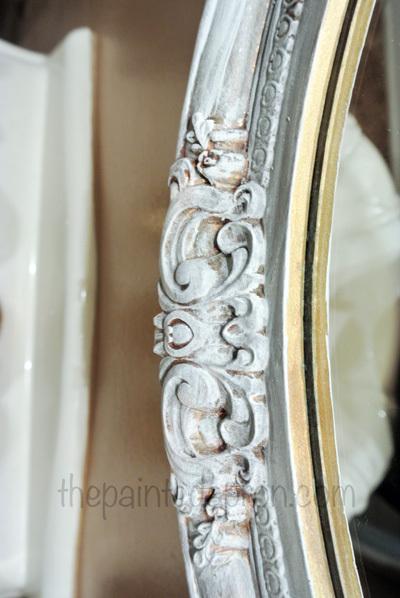 Thanks for sharing your powder room re-do and thanks for letting me blather on! Thanks Kadee! I love the idea of the tone on tone paper! I didn’t explain in my post that the curtain is temporary and will go whenever I do the great re-do! Mary said the gold fixtures were back in now, and when I told my hubs this he said, oh great, next we’ll all be wearing bellbottoms! Glad your house sold with the gold, and I loved your blather! Your redo is so wonderful!! 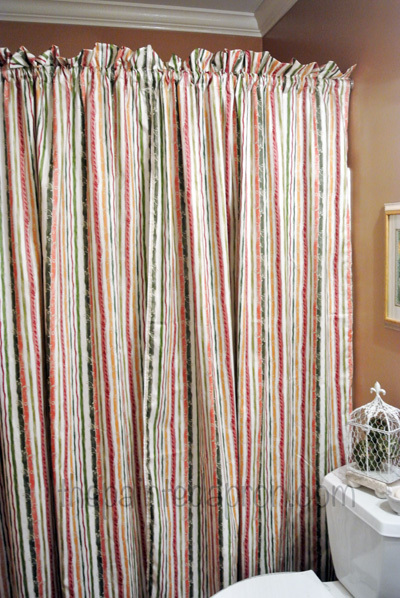 I much prefer the striped fabric curtain rather than the old stuffy ones in their. They add so much color and warmth and give it that extra zip. But I agree with the others–don’t close it all the way it makes the room even smaller like that. I think the wall color should be a muted shade also of one of the striped colors. A patterned wall paper would also draw the walls in—a plain all over color makes them ‘expand’. A cute tie back one that is out of the ordinary would give even more appeal. 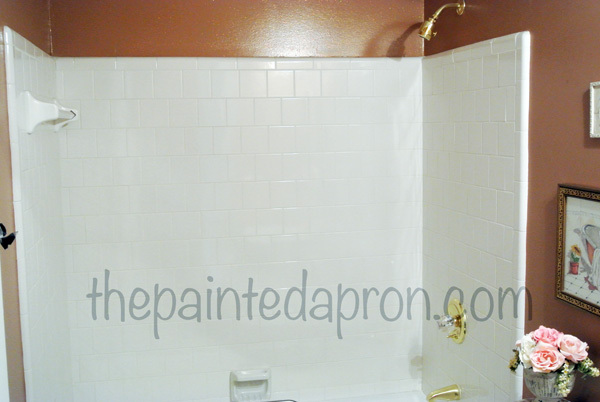 You could even ‘paint’ the fixtures a color of the stripes. they have metal primers–check at a home building store near you and ask them about that. it would be cool to add the mirror treatment and use a water proof varathane or something to cover it to protect it. Hey I used to be like you, worrying about guests not liking my style or whatever. I gave it up. I decided WE live here and they just visit. If they don’t like something they don’t have to look. Our bathroom is a conversation piece–or starter. I have a collection of glass/porcelain hands that hand around the big square mirror and medical advertisements on the walls. They are ” Warning: Chicken Pox exist on these premises. signs for every common childhood disease that occurred when the doctor would confirm these cases at home. Some people love it others make very interesting comments. We love it and that is what matters. I have a friend that put plastic containers in their extra tub and stored her linens and towels in there because they had no space for anything but a pedastall sink in that bathroom. She spray painted them to match the walls. I am sure whatever you do will look wonderful!! Thanks for all your enthusiastic comments Catie! This is only a temporary re-do, I really want to put wallpaper on the walls and probably go with a plain curtain…after all this color I am now thinking about going all shades of white! You never know! But at least it’s freshened up until I get around to more!